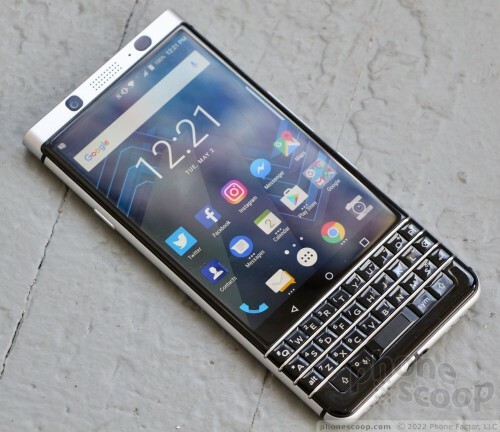 The KEYone is made by TCL and it runs Google's Android operating system, but this phone clearly has the heart and soul of a BlackBerry beating within. 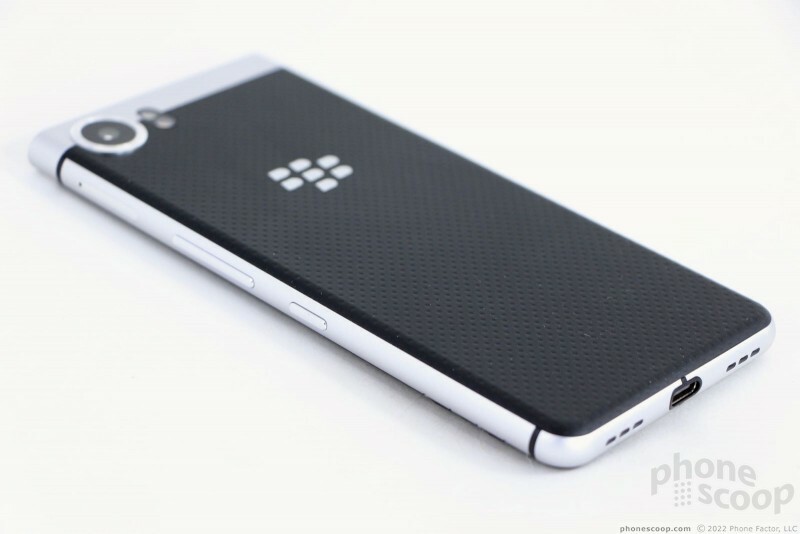 BlackBerry and TCL designed the KEYone together to ensure it offers the best from BlackBerry, TCL, and Google. With a physical QWERTY keyboard at your disposal, feel free to get your emailing and messaging on while enjoying epic battery life and powerful performance. 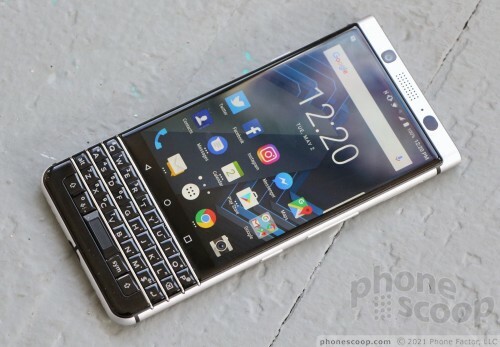 Here is Phone Scoop's in-depth review of the BlackBerry KEYone. The BlackBerry KEYone targets a very specific type of user: business folk who need a secure handset with powerful messaging features and prefer typing on real keys instead of glass. The KEYone purports to offer the best of both worlds: a big touchscreen and a physical QWERTY keyboard for the ultimate in input. If you're pining for the BlackBerry days of old and miss real buttons when typing out those mobile emails, the KEYone has you covered. 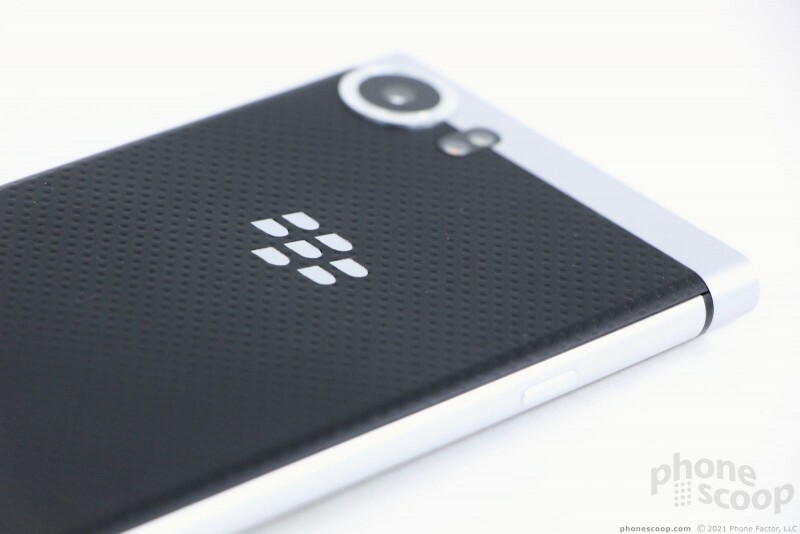 Last year, BlackBerry partnered with TCL, the parent company of Alcatel, and kicked out the DTEK50 and DTEK60 smartphones. Neither of these was entirely new; instead, they were rebranded variants of Alcatel's Idol 4 and 4s, respectively. 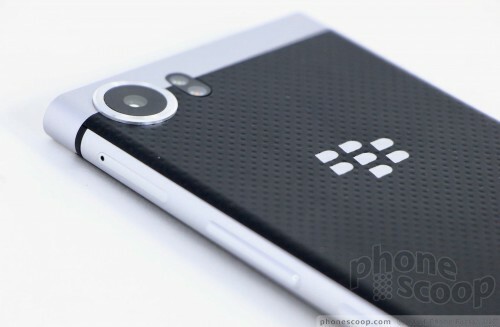 The phones used TCL's hardware, but ran BlackBerry's secured version of Android along with its enterprise-class email, messaging, and communications tools. The KEYone is an altogether different animal. 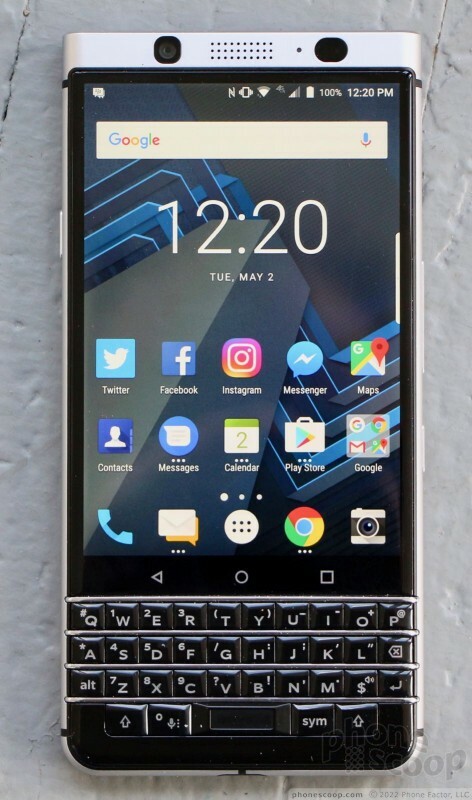 BlackBerry and TCL worked on the KEYone together from the start, which means it is a unique handset and not a retread of some older phone. BlackBerry hopes the KEYone will offer the right blend of hardware and software to appeal to its core customer base, businesses and governments. The KEYone merges the design heritage from the BlackBerry of old with modern materials and aesthetics. 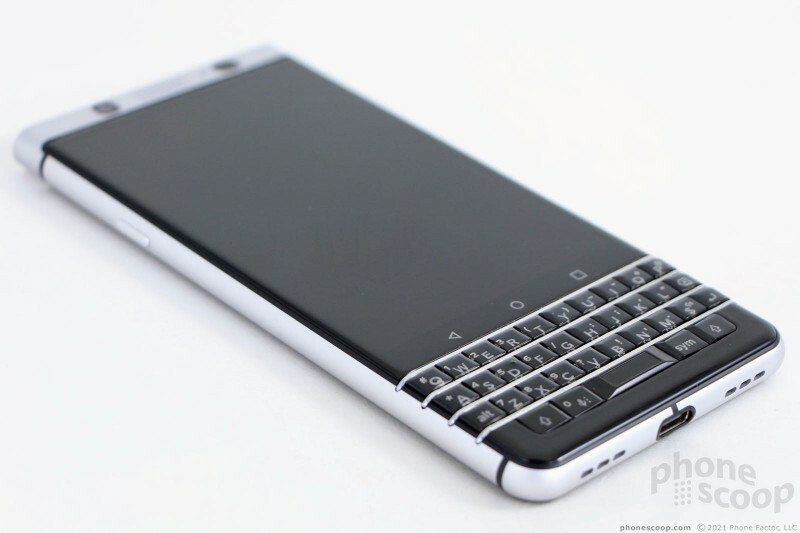 The KEYone carries over BlackBerry's signature chrome frets on the keyboard and black, patterned rear panel. 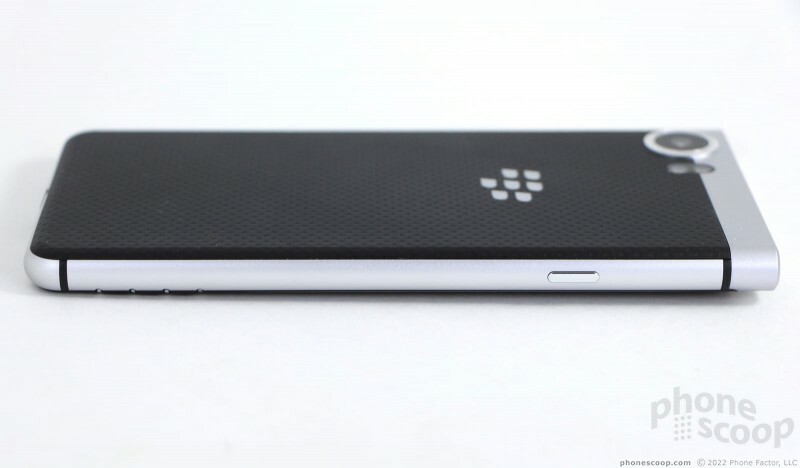 These are features BlackBerry fans will be sure to appreciate. The plain metal frame and black exterior components are conservative to a fault, though the phone still manages to put forth some personality. For example, the left, bottom, and right edges are all curved while the top edge is perfectly flat. In fact, the phone can do a headstand on a level surface, something not many modern phones can lay claim to. It lends the phone a unique industrial look. The KEYone looks a lot bigger than it really is. For example, it's significantly smaller than the iPhone 7 Plus and Pixel XL. However it looks like an absolute brick when set next to the smaller Galaxy S8. What bugs me most is the phone's thickness: it measures 9.4mm thick, which is 1-2 mm more than many of today's better phones. 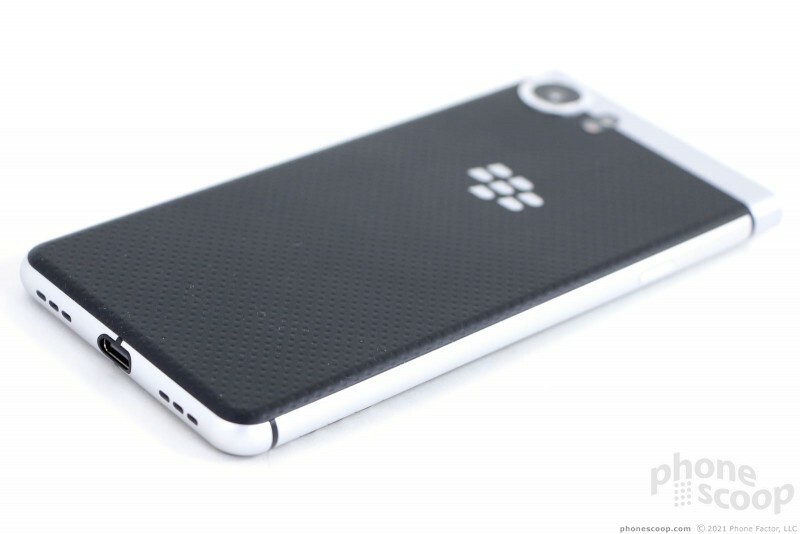 The rounded profile and rubbery rear panel contribute to what I'd call a nice in-hand experience. I think most people will be able to use the phone comfortably, though those with the smallest hands may find themselves using both. It can be hard to reach the top of the screen without adjusting your grip. The phone travels well enough in your pocket, yet the thickness and flat top surface (with hard edge) make it noticeable in tighter clothing. I'd call the materials and fit-and-finish of the phone good. It can't quite compete with today's top phones, but it's probably not trying to. The aluminum frame that forms most of the KEYone's exterior has a slightly grainy finish. The KEYone's body consists of a good number of small pieces assembled together, with glass and plastic on front, plastic on the back, and black antenna lines slicing across the metal chassis pieces. The antenna lines, unlike those on most phones, are a bit gritty and not fitted into the frame seamlessly. This leaves it feeling roughshod. The KEYone is hefty and strong, and yet I can't help but feel the phone could be a bit more refined. The KEYone's face is a busy place. It's mostly black, though metal and chrome accents help break up the blackness a bit. The display glass takes up only about two-thirds of the front surface and is curved pleasingly along the side edges. 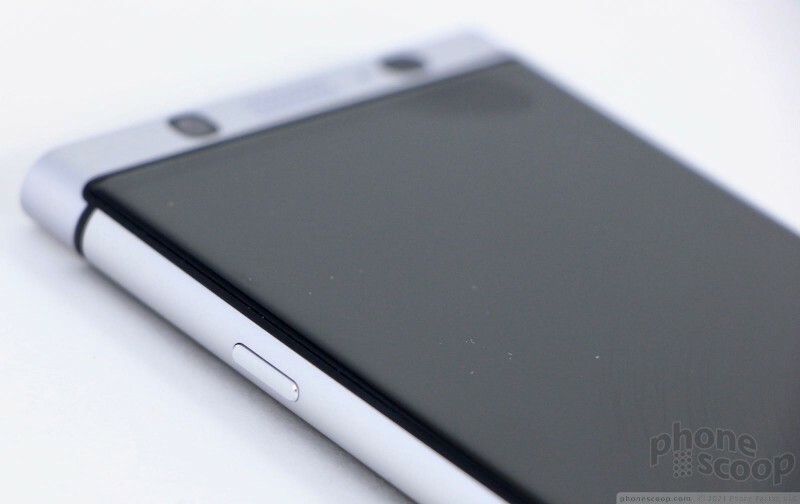 The phone's forehead has an obvious user-facing camera, grille for the earpiece, and sensor array. 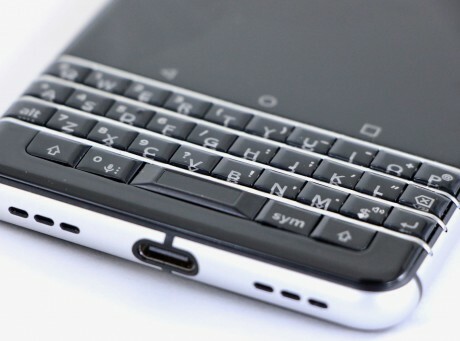 BlackBerry and TCL opted for capacitive controls (back, home, multitask) for the phone, which are tucked between the display itself and the physical QWERTY keyboard. 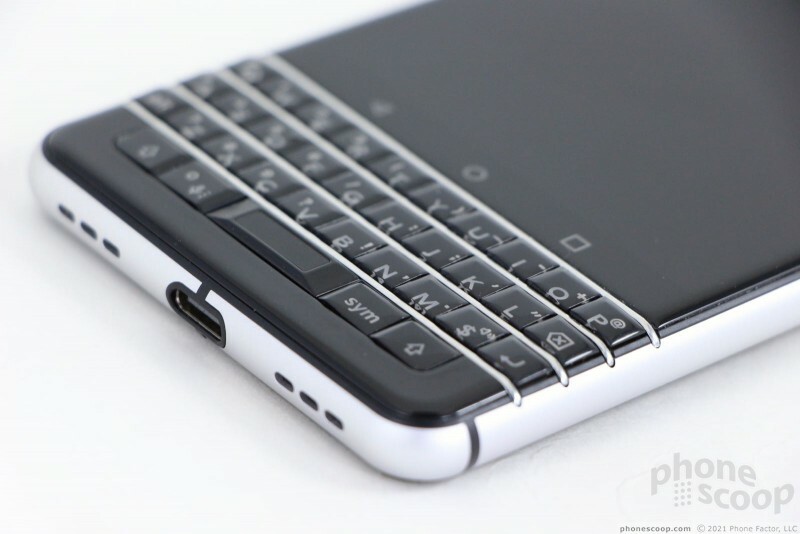 BlackBerry keyboard aficionados should be relatively pleased with the keyboard. 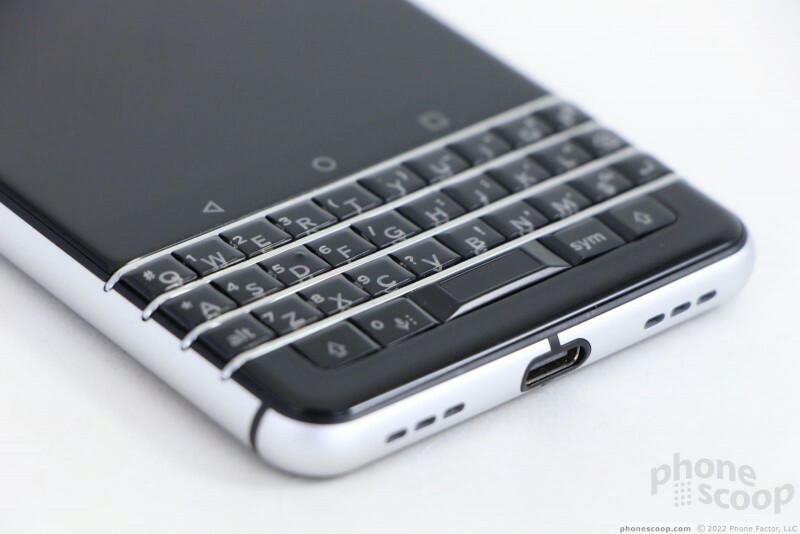 They keys are black and each row is separated by BlackBerry's signature chrome frets. I found the keyboard was easy to reach and use with a single thumb, but it's most effectively put to use with both thumbs at the same time. The individual buttons have minimal shaping to them and feel like they are covered in gel. Travel and feedback of the keys are decent, as each produces a pleasing click when pressed. The whole thing feels a little squished at first, though I was able to adjust to its size quickly enough. In addition to letter keys, there are dedicated buttons for delete, return, alt, caps, symbols, and voice dictation. The space bar is by far the largest button with the biggest profile because it doubles as the fingerprint reader. I don't like travel and feedback as much; it feels mushier and cheaper than the other keys. 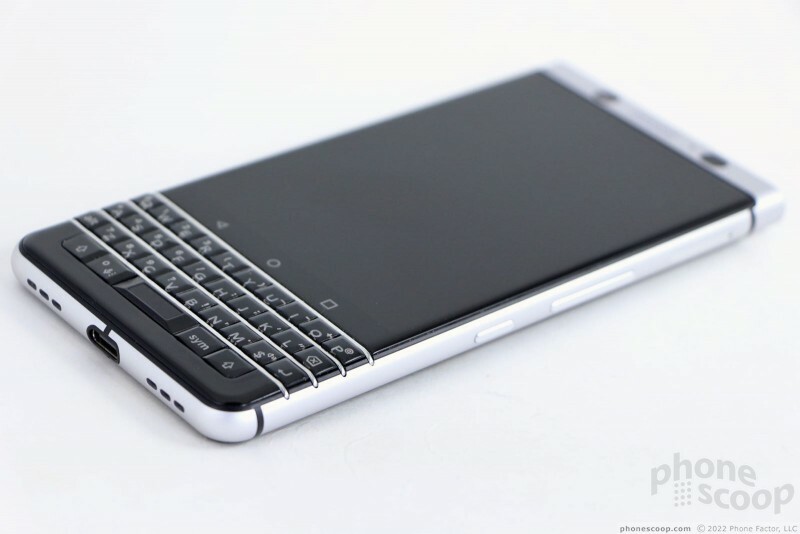 Last, like the BlackBerry Priv, the entire keyboard acts as a mouse. You can swipe your thumb across the keys to move the cursor around on the screen, select text, browse through your photo album, and more. After some practice, this function works well. A single button adorns the KEYone's left edge: the lock key. The placement drives me nuts; it's too high up on the side. I found it hard to reach and use. (This issue is common with Alcatel phones.) The button has a decent profile and good travel/feedback. 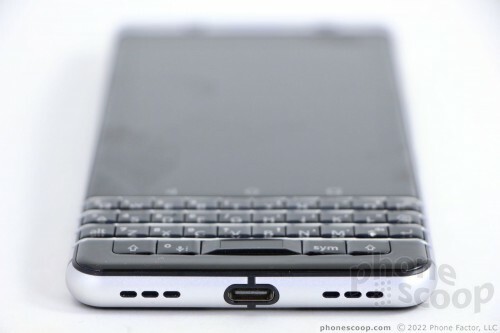 What makes this so frustrating is that the user-assignable BlackBerry key is on the right edge, exactly where you expect the screen lock button to be. I can't tell you how many times I pressed the BlackBerry button looking to unlock the phone. BlackBerry and Alcatel have this backwards as far as I am concerned. 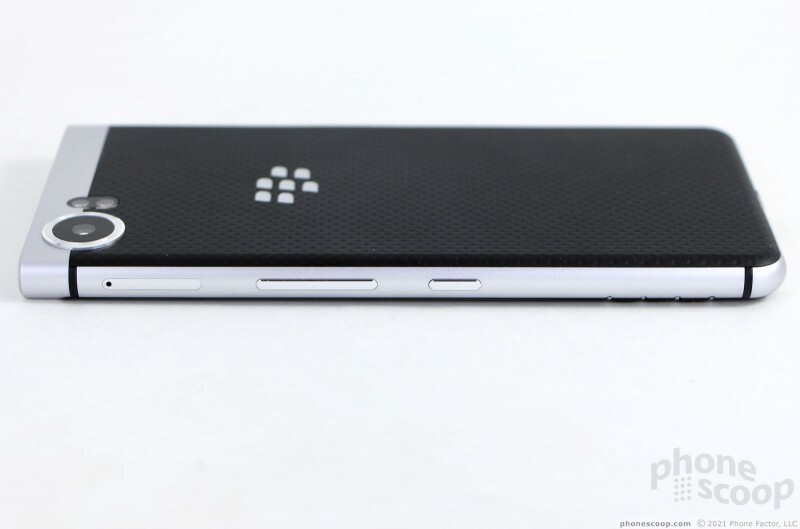 The BlackBerry button has a decent profile, and feedback is pretty good. The volume toggle, also on the right edge, is a bit flat and mushy for my tastes. The bottom edge of the phone holds the USB-C port and it is flanked by large holes for the speakerphone. I'm happy to see USB-C on this phone. The dual-purpose SIM / memory card tray is tucked into the KEYone's right edge. A paperclip ejects it easily enough. The tray is made of metal and comes across as strong. Music lovers will be happy to learn the KEYone includes a standard 3.5mm headset jack. It's located in the far left corner of the top edge. Confusingly, the flat top edge looks like it is removeable thanks to a large plastic piece and small hole that appears to accommodate a SIM card tool. In fact, this hole is a microphone. If you stick the SIM card tool in it, which I'm afraid many people are likely to do, you'll damage the microphone. 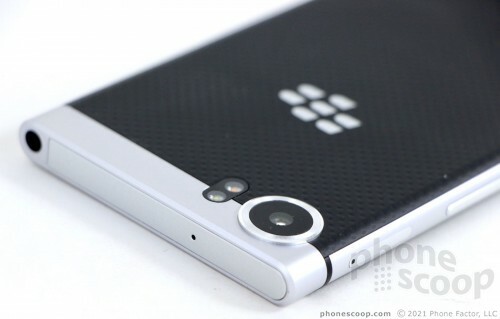 BlackBerry / TCL need to place some sort of warning or sticker on the phone. The camera module is absolutely huge and protrudes quite a bit. The module is about the size of a nickel. A two-tone flash is just off to the right. The remainder of the rear surface is formed by a polycarbonate panel with a dimpled, soft-touch texture. It's a classic BlackBerry look, though leather, pleather — or even vinyl — might have been even better. 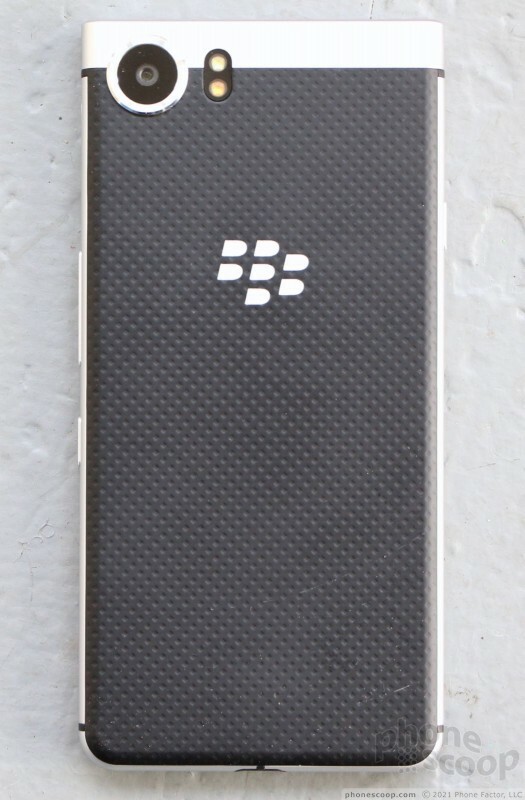 The BlackBerry logo is stamped into the rear panel in chrome. It's eye-catching, to say the least. The rear panel is attached firmly and the battery is inaccessible. I'm a bit disappointed the KEYone isn't waterproof. Adding a physical keyboard to a modern smartphone may seem like a throwback, and it certainly introduces some compromises, such as a smaller screen. Those who prefer a more tactile typing experience to sliding their finger around on glass may appreciate what BlackBerry and TCL are offering in the KEYone. The display measures 4.5 inches across the diagonal and adopts a 3:2 aspect ratio. 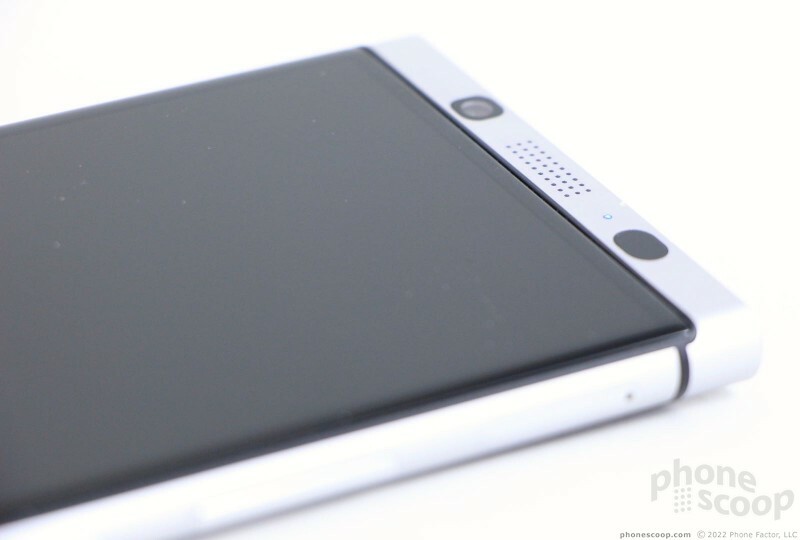 BlackBerry says the display offers "full HD" resolution, but that's a bit of a fib. In reality, the KEYone has 1,620 by 1,080 pixels, which makes it 300 vertical pixels shy of true Full HD. Nitpicking aside, the display is bright, sharp, and clean. On-screen elements are smooth and individual pixels are invisible. The LCD panel produces plenty of light, allowing the phone to be used indoors and out. Viewing angles are pretty good; there's both brightness drop and blue shift when the phone is tilted side-to-side, but the effect is minimal. This isn't the best screen for watching HD movies. You can view video, of course, but the odd aspect ratio squishes content, especially stuff that's in a wide-angle format, such as a 2.35:1 movie. You cannot use the KEYone as a tool for exploring virtual worlds. The keyboard prevents it from working with even the simplest VR headsets, such as Google Cardboard. TCL has two versions of the phone. The V1 model supports the majority of LTE Bands used by AT&T and T-Mobile, while the V2 model tosses in TDD-LTE 41 and CDMA 0, 1, and 10. Both versions will work on AT&T and T-Mobile, while the latter will be better suited to Sprint and Verizon Wireless. It's a shame neither version supports T-Mobile Band 66. 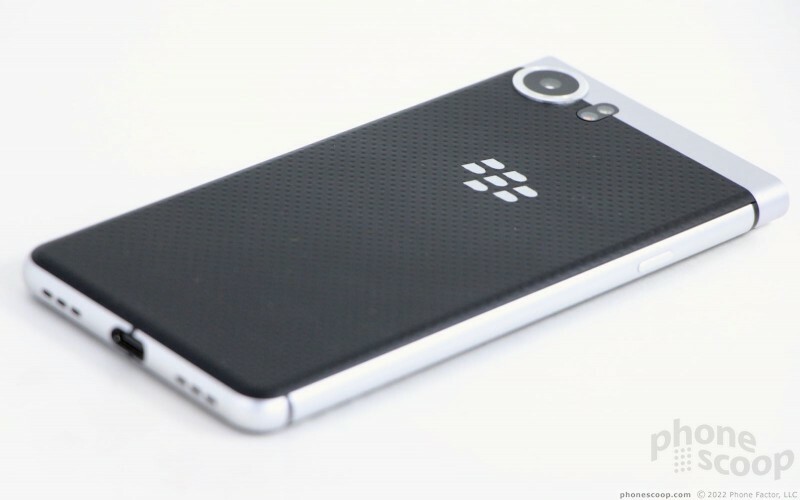 BlackBerry sent me the unlocked V1 model and I tested it on AT&T and T-Mobile. I would call the KEYone's performance average. The phone connected to both wireless networks' signals with no issue. It defaulted to 4G most of the time, but I saw it drop down to 3.5G in weak signal areas on T-Mobile's network (this is typical). The KEYone's ability to connect calls is not in question. The phone didn't give me any trouble patching through on the first dial. It did drop one call at highway speeds, but it didn't miss any. The quickest download I saw on either network was 30 Mbps while the fastest upload was less than one-third that at 8 Mbps. The phone did post slightly faster peak speeds on T-Mobile than it did on AT&T, but speeds were more consistent across the board on AT&T. This reflects my experience with many other phones, which means the KEYone does as well as it can. Streaming media (Spotify, YouTube) via LTE was acceptable with only minor amounts of stopping and buffering. Normal activities such as checking email and social networks never gave the KEYone's LTE radio any trouble. TCL put together a fine voice phone in the KEYone. Calls made normally via the earpiece were crystal clear. Voices sounded warm and present during calls. Clarity was very, very good, but I wish the earpiece produced just a bit more volume. I could hear it in all but the noisiest spaces. Those I spoke to through the KEYone said I was "very clear" to their ears. The speakerphone isn't quite as good. If you're in a quiet space such as room or office with the door closed, you'll enjoy reasonably clear calls at acceptable volumes. Even a modest amount of noise will force you to raise the volume and therein introduce a small amount of speaker distortion. You can hear calls in a moving car, but it's not easy. Ringers and alerts are reasonably loud, but not as loud as I'd like. The vibrate alert is very good. One place the KEYone excels is battery life. TCL crammed in a 3,505 mAh battery and it delivers. I consistently found the battery pushing through two full days, and sometimes it crawled its way into a third. As always, I tested the phone with all the radios on and the brightness set to 50%. We can likely thank the smaller screen and mid-range processor for the phone's power proficiency. The KEYone outlasts nearly all of today's top handsets, hands down. Last, the KEYone includes Boost Mode, which is more about charging than it is about conserving battery. With Boost Mode enabled, the phone will use as little power as possible as it charges, thereby allowing it to charge more swiftly. This is how BlackBerry gets away with saying the phone can ingest half its capacity — about 1,750 mAh — in just 30 minutes using the included charger. The phone doesn't support wireless charging. With Bluetooth 4.2 aboard, the KEYone paired and connected with headphones, speakers, and other accessories with minimal impact to battery life. I was pleased with calls made via Bluetooth headphones. Just as with the earpiece, clarity was good and volume was good enough. Calls patched through my car's hands-free system were acceptable in terms of clarity and volume. Music sounded okay when used with stereo headphones, but I wasn't blown away. GPS worked just fine on the KEYone. In Google Maps, the blue dot always showed up right away and was never more than 15 to 20 feet from my real location. The app ran swiftly over LTE. I found the KEYone to be a fine real-time navigation tool. The NFC radio was helpful in pairing with some Bluetooth accessories and also supports Android Pay for mobile payments. The WiFi functioned well enough.